Nigerian and Eastern European organized crime networks specialize in sending counterfeit checks and money order to unsuspecting scam victims for the purpose of money laundering. These same networks obtain the account information of their scam victims and wire money stolen from another account holder into the scam victim's account. In both instances, the scam victim is told to send a large portion of the money by Western Union or MoneyGram to false names, usually in foreign countries. The scam victim has now engaged in money laundering, will owe the entire amount of money he sent off, and is at high risk of being indicted for theft, forgery, and money laundering. How to verify a draft. Sending a draft for Collection. 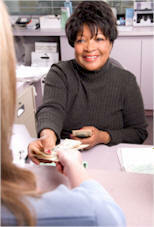 A draft is a money order or any kind of check, including cashier's checks and Treasury checks. You will find a list of drafts below, but please continue reading. You cannot rely on your bank, credit union, PostBank, or check cashing store to protect you from counterfeit, stolen, or forged drafts. It's not their job to watch out for you, it is your job to watch out for them. Like you, merchants, banks, and credit unions have the rightful expectation of being given good money. BY LAW YOU ARE LEGALLY RESPONSIBLE AND FULLY LIABLE for any and all checks or money orders deposited into your bank account by you or someone else, and for any funds wired into ANY of your accounts by you or someone else. Your are 100% liable for any and all funds deposited into any of your accounts by any means whatsoever. Funds wired into ANY of your accounts by a stranger may be stolen funds. This includes your checking, savings, credit card, portfolio, or any other account. You and your accounts can be used for money laundering. BY LAW YOU ARE LEGALLY RESPONSIBLE AND FULLY LIABLE for any checks or money orders you cash anywhere. endorse / indorse: To write one's signature on the back of (a check, for example) as evidence of the legal transfer of its ownership, especially in return for the cash or credit indicated on its face. When you sign your name on the back of any draft, you are signing a contract. Your signature means that you "endorse" the draft, which is to say that you are vouching for the trueness and creditworthiness of the draft, and that you assume full responsibility for the draft plus any fees if there are any problems with it. The ONLY way to verify any draft, including Cashier's Checks, is to contact the account holder and and ask that the draft be verified against the ledger. You want to know if that draft was made out to you for that amount. Caution: Do not call the phone number printed on the draft - these are often printed there by the counterfeiter. The phone number ma be a drop phone used by scammers to verify counterfeit checks, usually a prepaid, untraceable cell phone. Call Information for the account holder's phone number. Cashier's checks: contact the issuing bank. Corporate checks: contact the corporation; for large corporations, ask for the Accounting Department. Money orders: contact the seller. Treasury Checks: contact the office of issue. Traveler's checks: contact the seller. Electronic or ACH checks: instruct your bank to send for Collection. Foreign drafts: instruct your bank to send for Collection. Traveler's check warning: You cannot accept any Traveler's check made payable to you unless BOTH signature lines on the face of the check have been signed by the maker. Under no circumstances are you to ever sign the front of a Traveler's check unless you are personally buying one. Top left and bottom left on the face of check. One line is signed in front of the clerk selling the Traveler's check, the other line is called a countersignature and is signed in front of the payee. Both signatures must match. What "Clear" really means: "The check has cleared" does not mean the money in your account belongs to you. It only means that the clearing house has not sent the draft back for non-sufficient funds, closed account, or flag instructions on the account. It does not mean the draft was written by the account holder. Depending on the size or purpose of the account, the account holder may not notice the absence of funds for several days after the draft has reached his bank. In fact, an account holder may have up to one full year to report an unauthorized draft. Bank statements are usually sent out on the 1st or 15th of the month. If the transaction took place near one of those dates, the account holder may be unaware of the unauthorized transaction until statements are sent out the following month and time is taken to balance the statement. What "Available funds" really means: "Available funds" does not mean the money in your account belongs to you, even if a hold has been taken off the draft. A bank or credit union can make an exception to the rule and wait for a longer period of time on any given deposit before crediting the depositor account, but apart from such an exception the credit is automatic. This credit to your account is called a "provisional loan" and is actually a no-signature loan from your bank to you. It does not mean that your bank has been credited by the account holder bank. ALWAYS ask your bank if the draft has been honored and DO NOT TOUCH THE MONEY until it has. When in doubt about a draft, tell your bank to send the draft for COLLECTION. Sending a draft for Collection: When you send a draft for Collection, it means that your bank or credit union will not put any money in your account until the draft has been paid, i.e. your bank has received the credit from the account holder bank. Your bank or credit union will charge you a fee and give you an approximate time before the draft is honored. This time period may be as long as 6 to 8 weeks depending on the location of the account holder bank. Some banks and credit unions will provide the collection service even if you do not have an account with them, so long as you pay the service charge. Accepting a draft made out to someone else: NEVER accept 3rd party drafts. A 3rd party draft is one where someone else's name is on the Payee line. It doesn't matter if your son, daughter, parent, or best friend asks you to deposit his or her check into your account, don't do it even if it's a cashier's check. You are completely liable for the draft the moment you endorse it. Accepting payment in your name for the services or products of another, no matter where you live: You are placing yourself at enormous risk by accepting payment in your name for the products and services provided by another. For one thing, you are accepting responsibility for those products or services. If the product doesn't show up, the buyer will come to you for redress. You are also accepting to pay all the taxes, and if you have placed the funds in your personal account you will be expected to add the amount to your personal income taxes. NOTE: If you are the victim of a Payment Processing Scam, please know that your name may be used to open fake eBay accounts and Classified ads selling non-existent products. The payments you are receiving may be from people who believe you are selling product on the Internet or through a local newspaper and they will be waiting for delivery. Funds wired into your account are your responsibility. If the money that was transferred into your account is stolen, your bank has the right to sweep your account and to hold you criminally liable. You can prevent this from happening to you by placing instructions on your account that no money is to be wired into your account without your specific written approval. Never, ever allow strangers to wire funds into any of your accounts. When you send money by Western Union or MoneyGram, the money is gone the moment it is picked up and there is no money trail. Nigerian and Eastern European fraud gangs know that they are untraceable once they pick up the money, which is why they want their victims to use these money wiring services. If you are processing payments for a foreign employer, please know that no legitimate employer would ever ask you to wire funds this way, nor would they ask you to process payments for them. There are firms that specialize in this type of service that know the legalities required by US and foreign tax collection agencies, the accounting required to be compliant with accounting practices laws, and understand the required banking procedures. If you have received an overpayment, lottery payment, drafts from an online relationship, or any kind of draft as the result of any association you have developed locally or on the Internet in which you are asked to accept a draft and wire a portion of the funds via Western Union or MoneyGram, please understand that you are placing yourself at great risk. Follow the instructions above to verify the draft. Better yet, refuse to comply. If you are receiving money by Western Union and are being asked to wire it on by Western Union or MoneyGram, then it is probable that your are being used as a mule (courier in an illegal operation) in a money laundering scheme. US Residents: If you are a US resident, any letters or packages you receive, by whatever method, foreign or domestic, fall under the jurisdiction of the US Postal Service. Print VOID across the face of each draft. Place the drafts and any enclosures back in the envelope. On the back of the envelope (outer envelope if double) print [NAME OF SCAM], COUNTERFEIT DRAFT, ATTN: US POSTAL INSPECTOR. Drop the envelope off at any Post Office, back side up so they can see what you are handing them. If you wish to file an enforcement report to go with the above, please click HERE for the Adobe Acrobat PDF USPS Mail Fraud form. Click on the printer icon in the toolbar to print the form. Free Adobe Acrobat Reader 7.0 download. Outside the US: If you are not in the US, please contact your postal service to see if they have a Mail Fraud division. If your postal service does not have a Mail Fraud Division, and if you cannot drop the voided drafts and envelope(s) off with your local police, then please completely destroy the drafts and envelopes.